Brain AVMs are a very large and complex subject matter, and detailed discussions are well beyond the scope and purpose of this page. 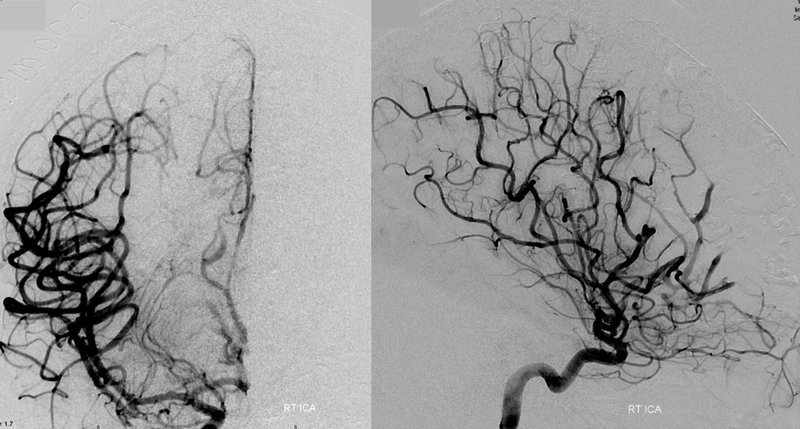 What’s important to realize is that brain AVMs are an abnormal tangle of small vessels (called nidus) which directly connect brain arteries to brain veins, without any capillaries in-between (as should be normally the case). This results in a kind of short circuit, whereby blood goes directly from arteries, through the nidus, and into the veins, bypassing brain tissue. Why, when, and how AVMs form? The short answer is that we don’t know why or how. When is a little easier — they are probably present at birth in tiny, microscopic forms. As the brain grows, so does an AVM. It is not a cancer and cannot spread, but it does grow — both the nidus and its feeding arteries get larger while the body grows, and continue to change throughout one’s lifetime. In a small minority of patients, there is a genetic predisposition to forming the AVM, but most cases seem to be “sporadic” or random. In the future, we will likely find abnormal genes in some of these people, but at the present time we don’t yet know what they are. The positive aspect of this is that in most AVMs are not inherited. Mostly in two ways. First is bleeding — the vessels which make up the nidus are fragile and can rupture, which results in bleeding into the brain. Arteries which feed the AVM over time can form aneurysms (weakness in arterial wall which leads to bulging) which can rupture as well. These aneurysms behave very differently from the more common “Circle of Willis” aneurysms, which are separately discussed. Finally, veins which empty or “drain” the AVM, over time can get either narrowed or dilated (from high flow venopathy), both of which can lead to rupture. All of these kinds of ruptures lead to bleeding into the brain. The outcome of bleeding depends highly on location and extent of bleeding and subsequent treatment. Patients who survive bleeding may be left with permanent neurologic damage (paralysis, speech problems, etc). Many develop epilepsy (seizures) because of bleed-related brain damage. The overall probability or risk of bleeding at any given time is quite low — most AVMs have a bleeding risk (known as annual rupture rate) of about 1-2% per year. This is low at any given time, but adds up over a lifetime, so that the majority of patients who have an AVM will bleed at some point. Moreover, some anatomical features of the AVM make it more likely to bleed. The average risk of death from AVM bleed is about 10%, though some locations can be predictably more or less dangerous. The second way in which AVMs cause problems is by “stealing” blood away from the brain. This can cause strokes (not bleeding types, but an ischemic ones) and seizures (epilepsy). Other problems depend on location of the avm, but can include paralysis, speech, vision, psychiatric, and other problems, headaches, etc., depending on location of the AVM. Where in the brain do AVMs form? Anywhere in the brain. Location of the AVM is one of the main determinants of what kind of neurologic problem will arise should the AVM start to “act up.” For example, AVMs in the left temporal lobe are likely to cause problems with making speech, because most people have their speech circuits in the left temporal lobe. AVMs in the brainstem (central part of the brain) cause all kinds of problems because of the many vital structures located there. AVMs come in all sizes. Size can influence treatment options, as larger AVMs are usually more difficult to treat. Curiously, the risk of bleeding is not directly proportional to size, and in fact smaller AVMs seem to bleed a little bit more frequently. AVMs can be diagnosed either as a result of bleeding or other problems, or “incidentally.” With increased availability of MRI and CT scans, many patients are found to have an AMV after having a scan for an unrelated problem (such as CT scan after minor head trauma, etc). Most patients, following AVM diagnosis, are referred to a neurosurgeon or neurointerventional radiologist, and undergo a diagnostic cerebral angiogram. Cerebral angiogram is a procedure where a small but long catheter is put into large artery in the leg and under x-rays navigated into several neck arteries that supply blood to the brain. A contrast dye is injected through the catheter, and flow of dye from arteries through AVM and into veins, as well as contrast flow through normal brain vessels, is photographed by x-ray cameras. This provides specialists in AVM treatment with all kinds of important information about how blood flows through the AVM, which arteries feed it, which veins drain it, and what kinds of effects the AVM has on the brain. The vast majority of physicians specializing in AVM treatment require an angiogram before any treatment is contemplated. Many additional diagnostic tests can be useful, such as MRI, MRA, CTA, EEG (for evaluation of possible seizure activity) and other tests. The exact sequence and nature of diagnostic tests depends on particular AVM characteristics and treating doctor preference. Treatment issues and modalities are usually very complex, and depend to a great extent on a number of factors such as AVM location, size, bleeding history, percieved future bleeding risk, patient age and overall medical condition. Although excellent methods have been developed to assess AVM treatment safety (most notably the Spetzler and Martin AVM grading system), the approach is individualized, and much does, and rightfully should, depend on your doctor’s preference. In other words, there may be more than one “right” way to deal with the problem. In general, three types of treatment are available — catheter embolization, surgery (usually combined with catheter embolization), and radiation. 1) Catheter Embolization — the patient is put under general anesthesia. A catheter is introduced through the groin (like a regular cerebral angiogram) and navigated into an artery in the neck. Through this catheter, or series of catheters, a very small microcatheter is taken under x-ray into an artery which feeds the AVM, and this artery and parts of the AVM are embolized (plugged up) with a glue-like substance. Two main types are available — nBCA glue and Onyx. This kind of treatment sounds attractive because it is not very invasive, there is no brain surgery, and no big scar. However, it is good to keep in mind that only a minority of small AVMs can be completely cured by embolization. Most will still need to be surgically removed after embolization, though embolization can make surgery considerably smoother by reducing bleeding. Also, when complications happen during catheter embolization (infrequent though they are in places that have the required experience), the consequences can be just as devastating as when things go wrong during surgery. 2) Surgery — most AVMs are treated by a combination of surgery and preoperative catheter embolization. Embolization decreases blood flow through the AVM and allows the surgery to proceed in a more bloodless, controlled manner. Most AVMs cannot be completely embolized, and until the AVM is 100% gone, it is not cured, and associated risks remain. This cannot be overemphasized — an AVM which is 99% gone is not 99% less dangerous. In fact, aggressive embolization can in fact increase the risk of rupture of the remaining part of the AVM, for reasons that have to do with post-embolization changes in the anatomy of the AVM. That’s why its very important to remove the entire AVM, which often requires surgery. Pre-surgical embolization can be done either in steps, embolizing parts of the AVM at a time, with surgery at the end of a series of partial embolizations, which are usually done over several months. Another approach, which we favor, is to embolize as much of the AVM as safely feasible, in one embolization session, and operate in the next 24 hours, so that the entire treatment is done during one hospitalization, and risks of partially embolized AVM changes are minimized. 3) Radiation therapy — a relatively new method of treatment involves targeting the “nidus” of the AVM with a highly concentrated and extremely potent form of radiation, often called “Gamma Knife.” Gamma knife can deliver very high doses of radiation to a precisely mapped area, while keeping radiation dose to everything outside of the target at relatively low levels. High doses of radiation to the nidus causes it to involute, or shrink, over time. Although this treatment has not been around as long as embolization or surgery, it is highly effective for the right kind of AVM. 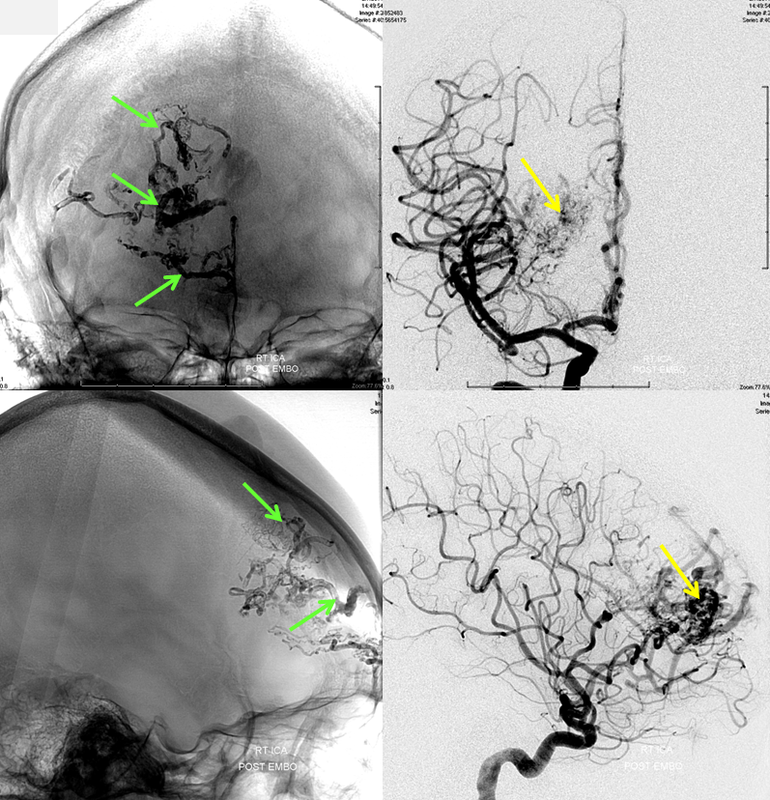 It is often the only reasonable treatment for AVMs located in vital parts of the brain, where embolization or surgery are not feasible because of high risks of brain damage. Gamma Knife is usually an outpatient treatment, and is non-invasive (although a cerebral angiogram is usually required for “targeting” the AVM). In centers with appropriate experience, overall results are excellent. Disadvantages include very small but much feared possibility of radiation brain damage and lack of cure immediacy (irradiated AVMs are not cured right away, but slowly shrink over months to years). While the AVM remains “alive”, a risk of rupture remains. Our Role: Brain AVM treatment should only be undertaken in a multidisciplinary fashion. While our role, as neurointerventional radiologists, is centered on performance of cerebral angiography and catheter AVM embolization, the NYU team consists of neurosurgeons, radiation specialists, diagnostic radiologists, neurologists, and other staff. Cases: The following series of AVM cases, treated at NYU, represents a spectrum of disease and its treatment. 1) Combined Embolization-Surgical Resection. The majority of AVMs are treated in this way. This patient came to the hospital following a seizure — a less common symptom than bleeding, and in this case fortunately leading to discovery of the AVM. 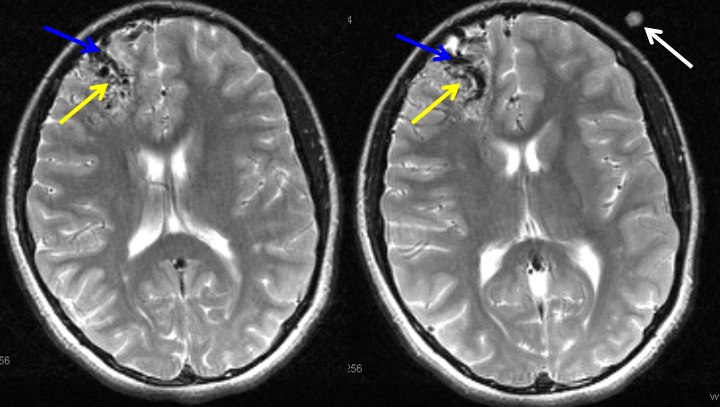 MRI of the brain shows an AVM (yellow arrows) in the right frontal lobe of the brain. Some of the larger AVM veins can be seen (blue arrows). A fiducial marker (white arrow — special marker which allows the surgeon to better locate the AVM during surgery) is also seen on this special pre-operative MRI study. Frontal (top row) and side (bottom row) images of the AVM obtained during pre-surgical angiogram and embolization. 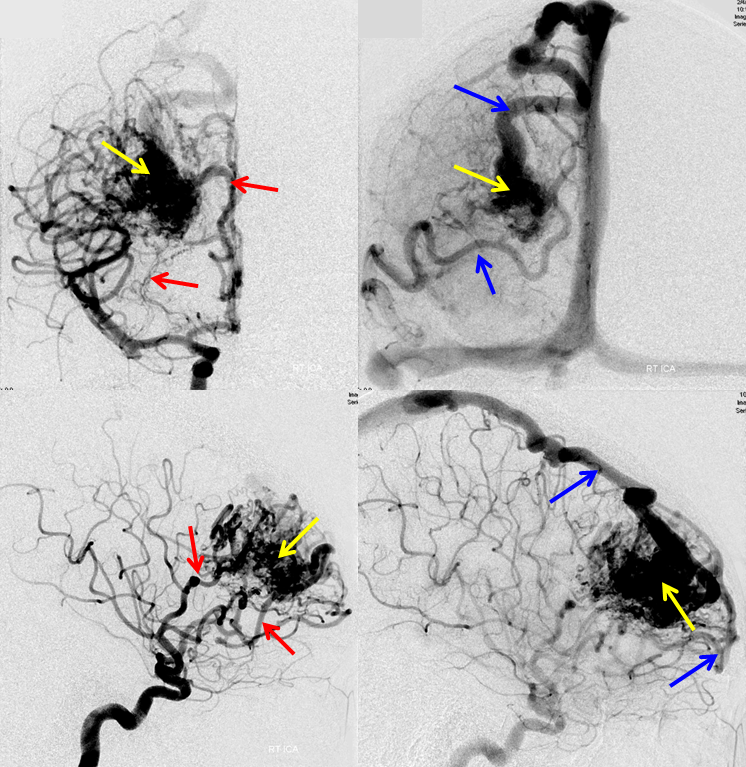 The AVM (yellow arrows) is supplied by numerous arteries, some of which are shown by red arrows, and emptied by one larger and one smaller veins (blue arrows). Front (top row) and side (bottom row) pictures of the AVM after n-BCA embolization. Glue (n-BCA) material is seen within AVM arteries and nidus (green arrows). The AVM is significantly smaller after embolization. As is typically the case for AVMs of this size and location, the entire AVM cannot be embolized safely, and requires surgery for complete cure. An angiogram is obtained immediately after surgery, to make sure that the entire AVM has been removed, which is almost always the case. 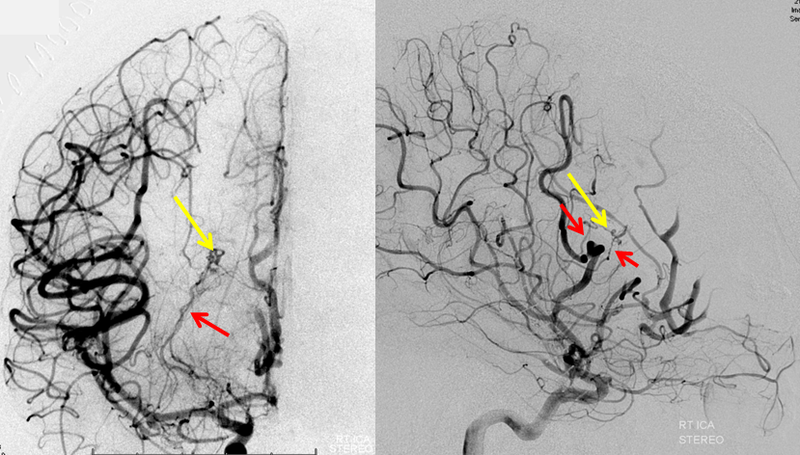 In this particular patient, a small AVM remnant is still present (yellow arrows), with its feeding arteries marked by red arrows. This shows the value of performing an immediate post-surgical angiogram. The patient has go back to the operating room to remove the remainder of the AVM. 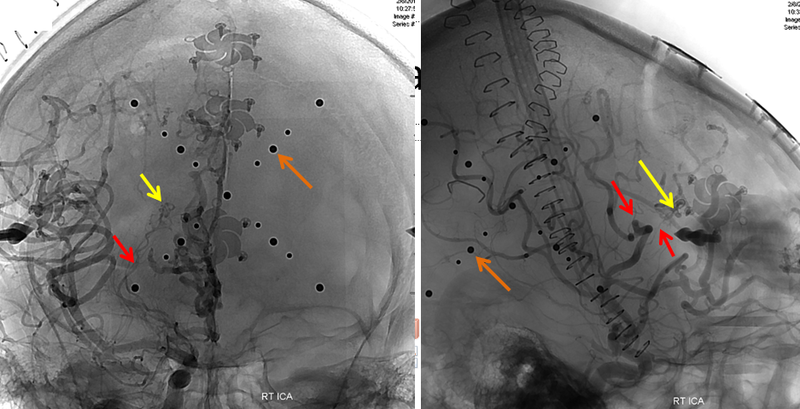 A special frame has been placed around the patient’s head before the second surgery, with multiple round markers (brown arrows) which are visible on this angiogram. The headframe, developed at NYU, allows for extremely precise targeting of the residual AVM, to spare brain tissue in this importat part of the frontal lobe.